Sean O'Sullivan, Irish Portrait Artist, Printmaker: Biography, Paintings. The Irish portrait painter and printmaker Sean O'Sullivan was born in Dublin in 1906. He studied drawing at the Dublin Metropolitan School of Art where he won a scholarship and studied lithography at the Central School of Arts and Crafts in London. After this, he studied fine art painting and figure painting in Paris at Colarossi's and La Grande Chaumiere. One of his Parisian neighbours was the sculptor Antoine Bourdelle (1861-1929). In addition, he met and made friends with Irishmen Samuel Beckett, James Joyce and Thomas MacGreevy, as well as the French painter Goeorges Rouault (1871-1958). Returning to London in the mid 1920s, O'Sullivan found work in book design and printmaking. Moving back to Dublin, he focused on portrait art, completing a number of paintings in oils as well as crayon and pencil. He began exhibiting at the Royal Hibernian Academy (RHA) in 1926, at the age of 20, contributing an average of six paintings a year until 1964. Most of his works were portraits interspersed with landscape painting of the West of Ireland. In 1928 he became the youngest ever associate member of the RHA, and in 1931 was elected an academician. During his distinguished career as a portraitist, Sean O'Sullivan drew or painted portraits of James Joyce, WB Yeats, Jack B Yeats, Maude Gonne, Eamon de Valera, Brendan Behan, John Broderick, Thomas MacGreevy, Douglas Hyde, MSD Westropp, Henry J Levitt, Ernie O'Malley, James Larkin, Alice Milligan, FJ McCormick, Bulmer Hobson, Sir Chester Beatty, Paul Landowski, and others. 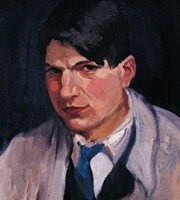 Many are held in public collections of Irish art in the National Gallery of Ireland, Hugh Lane Gallery, University College Dublin, Crawford Art Gallery Cork, Limerick Art Gallery, National Self-Portrait Collection Limerick University, and others. Fluent in Irish and French, gregarious and a renowned story-teller, Sean O'Sullivan also painted a number of murals, executed chalk drawings, designed postage stamps, and taught at the Dublin Metropolitan School of Art. He died of a stroke in 1964. 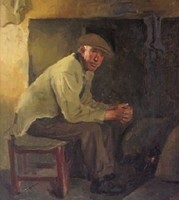 His works are represented in all major Irish art collections. The auction record for a work by Sean O'Sullivan was set in 2006, when his oil painting, entitled Seanachai of Rosmuc, was sold at James Adams, in Dublin, for €120,000.  For more about portrait painters like Sean O'Sullivan, see: Irish Art Guide.  For more about portraiture, see: Homepage.